Companies racing to create blockbuster new technologies in fields such as robotics, virtual reality and self-driving cars are increasingly hauling each other into court to protect their trade secrets in a series of legal fights that signal the fierce competition in emerging fields. As the battle over emerging tech heats up, companies big and small are filing suit against former employees who were hired by rivals and allegedly pocketed trade secret information on their way out the door. Businesses’ reliance on data, the technological ability to share vast amounts of data and cut-throat competition over highly prized tech sector employees all contribute to the uptick in trade secret litigation in the tech field, trade secret attorneys told Bloomberg BNA. 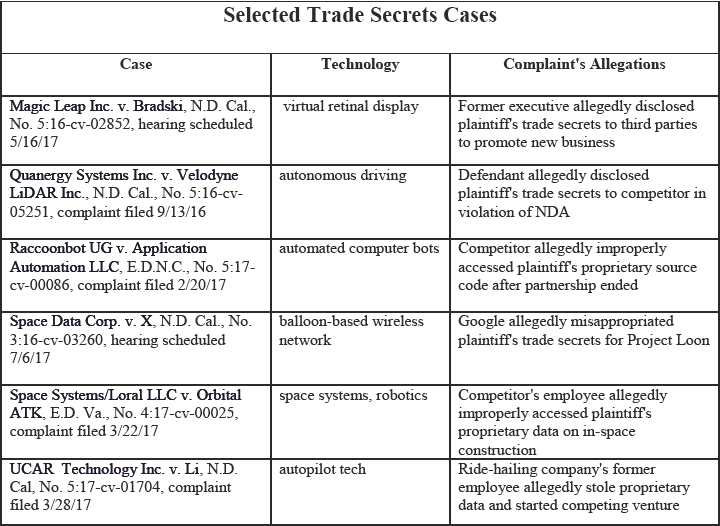 Companies working in robotics, alternative energies, semiconductors, online games and other emerging technologies filed at least 35 cases under a federal trade secret law that took effect in May 2016, Bloomberg Law data show. Alphabet Inc.'s Waymo and rival Uber Technologies Inc. are immersed in a lawsuit over allegedly stolen lidar designs, a technology essential for self-driving cars. At least an additional 10 cases have been filed in that same period in California alone under state trade secrets law, the data show. California is home to Silicon Valley tech giants such as Apple Inc., Facebook Inc. and Alphabet Inc.'s Google. To be sure, the wave of trade secrets litigation in these emerging fields signals a healthy market for innovation, some attorneys said. “When you see a lot more activity, it’s a signal that there is very intense competition going on in various industries over new data-driven technologies,” James Pooley, senior counsel at Orrick in Silicon Valley, said. The technology involved in the battle is lucrative, and companies that lock up talent and intellectual property are likely to have an advantage. Funding of startups using machine learning technology has reached more than $12 billion globally since 2012 and is likely to rise, according to Bloomberg Intelligence analysis and data from research firm CB Insights. IDC Research Inc. predicts the global-installed base of connected cars to triple by 2019 and generate 30 percent of 5G wireless traffic in 2020. 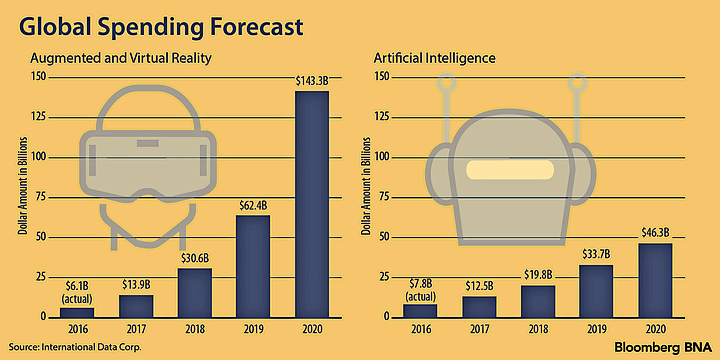 IDC also predicts virtual reality product sales to reach $84 billion in 2020. Eric Barton, senior counsel at Seyfarth Shaw LLP in Atlanta, said that litigation over trade secrets is traceable to increased competition over tech-sector employees—a prized commodity. The talent pool for employees capable of creating or building upon emerging technologies is fairly small, Barton said. Employees who move around in the field, leaving one company for a competitor, risk some level of exposure to their former employer’s trade secrets. Technology makes it easier for departing employees—especially tech-savvy workers—to steal confidential data, according to Barton. Cloud-based storage services, for instance, enable people to take larger amounts of data in more discreet ways, he said. In addition, services such as Dropbox, which are becoming more and more prevalent in business operations to share files, can make tracking viewers difficult, Barton said. “We’re seeing a wide variety of technologies as the basis for these suits and the real story behind this activity can be summarized in a word: data,” Barton said. In one high-profile case, video game maker ZeniMax Media Inc. won a $500 million award after a jury found Facebook Inc.'s Oculus had violated a nondisclosure agreement under which ZeniMax shared its virtual reality technology ( ZeniMax Media Inc. v. Oculus VR LLC, N.D. Cal., No. 3:14-cv-01849, motion for permanent injunction filed 2/23/17 ). The Oculus case represents a typical scenario in which two young companies shared data in an effort to get off the ground, but only one company made it big, Jay Bogan, a partner at Kilpatrick Townsend & Stockton LLP in Atlanta, said. That “casual” sharing of information between startups can lead to trade secret litigation down the road, he said, when the company that doesn’t hit paydirt sues the other for taking some of the information they developed together. “Every time you have a situation where a trade secrets defendant has definitely been exposed to trade secret data, and the technologies are similar, you have a risk of trade secrets litigation,” Bogan said. To protect their data assets from departing employees, businesses in most states can rely on employment contracts and trade secrets laws, with some exceptions. But in some cases, as in California, the only way to protect a trade secret is through a lawsuit. For the majority of states where noncompete agreements are in play, employers can enter into them to prohibit employees from taking similar jobs at competing businesses. However, noncompetes are generally unenforceable in California, according to Bloomberg Law, where Silicon Valley tech giants reside. Hawaii permits noncompete agreements, but not in employment contracts relating to a technology business, according to Bloomberg Law. Businesses have had the option of suing for trade secret theft under state or federal law since May 2016, when President Barack Obama signed the Defend Trade Secrets Act (DTSA), Pub. L. 114-153, creating a federal private action for trade secret misappropriation. Also, every state except for Massachusetts and New York has adopted some form of the Uniform Trade Secrets Act (UTSA), according to the Uniform Law Commission. Over the Horizon: More Paperwork, Fewer Suits? To sidestep court battles, Companies hiring employees who formerly worked at a competitor can take a number of precautions to avoid litigation. Bogan said that when hiring an employee, companies should require a statement saying they haven’t taken any trade secrets from their former employer. If that employee is later found to have lied, the company should confirm to her former employer that no trade secrets were entered into its database, Bogan said. And, when employees leave for a competitor, they should be reminded in their exit interviews that they signed a nondisclosure agreement, if applicable. The company should also get written commitments that the employees destroyed all trade secret data, he said. Barton recommended that employers limit employees’ trade secret access to a need-to-know basis. Also, companies should conduct forensic audits as part of the off-boarding process to ensure no trade secret data falls into the hands of a competitor, he said. Those audits can function as precautionary measures to avoid future trade-secret litigation. In one case involving a leading emerging tech company, a forensic audit didn’t prevent a lawsuit—but was included as part of a settlement. A forensic audit requirement was part of the April 19 settlement agreement in a trade secrets lawsuit by Tesla Inc. against the former director of its Autopilot program, Sterling Anderson ( Tesla Motors Inc. v. Anderson, Cal. Super. Ct., No. 17CV305646, settlement 4/19/17 ). The agreement requires Aurora Innovation LLC, the startup Anderson joined, to provide Tesla with the results of a third-party forensic audit to determine the presence or use of any Tesla confidential data. Links to the selected trade secrets cases are available at http://src.bna.com/oGs. Bloomberg Law's guide for drafting noncompete agreements is available at http://src.bna.com/olk.